The Bauhaus school was a modern design school in Germany between the first and second world wars, 1919 - 1933. By incorporating art , design and craft the school exemplified a new approach which had a big impact on our contemporary approach to creativity and design. The school was started when Walter Gropius became the director of the amalgamated Wiemar Arts and Crafts School and the Wiemar Arts Academy. He named new institution Das Staatliche Bauhaus in Wiemar (The state home for building), at the same time setting the school off in a new direction. The previous director of the Wiemar Arts and Crafts School (Henri van de Velde) was an art nouveau architect, but Gropius was primarily described as a modernist. The school, its philosophy and the ground breaking designs which it produced have come to be known simply as Bauhaus. The Bauhaus aimed to combine the talents of artists and craftsmen to design for the future. The faculty was structured as a hierarchy with masters at the top, then journeymen and student apprentices. This structure was a deliberate emulation of a German mediaeval craft workshop. The early years of the Bauhaus were spent in buildings at Weimar (1919-24). Initially the school was heavily influenced by expressionism and artists such as Klee, Kandinsky and Itten lead that direction. From about 1920, however, the De Stijl movement and constructionism became a strong influence on the Bauhaus style through artists such as Theo van Doesburg. Even though Van Doesburg was not on the staff, he ran courses in Weimar on De Stijl which many Bauhaus students attended. Towards the end of this period a new conservative government in Weimar tried to apply conditions on the school which the masters found unacceptable. In December 1924 all the masters signed letters of resignation effective from the end of their contracts in April 1925. The students also signed a letter to the government stating that they would leave with the masters. Gropius made plans to move the Bauhaus to Dessau and they subsequently moved into temporary buildings at Dessau in 1924 and then into purpose built facilities designed by Gropius when they were completed in 1926. During the Dessau years (1925-32) the Bauhaus flourished. Still influenced by De Stijl and constructivist ideas, it nevertheless developed its own formal design principles which could be applied to solve a design brief. The Bauhaus Corporation was formed to liaise with industry and market workshop prototypes. The masters became known as professors, and the master/journeyman/apprentice model was abandoned. In 1928 Gropius resigned to be replaced by Hannes Meyer (1889-1954) and with other personnel changes the Bauhaus moved away from the strict application of constructivism. There were increasing conflicts with the local government authorities in this period and in 1931 the Nazi dominated city council cancelled all the contracts with the Bauhaus. Mies van der Rohe moved the Bauhaus to an empty factory site in Berlin-Steglitz but Nazi harassment continued and the school closed in 1933. After leaving the Bauhaus many of the faculty and students left Nazi Germany to escape the persecution. This had the effect of spreading the Bauhaus ideas around Europe, USA and Canada. In this way the impact of the Bauhaus on modern design was made even more significant. Gropius began by publishing the Bauhaus Manifesto, in which he set out the philosophy behind the new school. As an architect himself, many of his ideas were formulated in the context of architectural design, but although architecture was always an important aspect of Bauhaus, the school was by no means purely a school of architecture. The Bauhaus in the Dessau years moved away from some of the detail, this document continued to be the core philosophy of the school. The Manifesto begins by stating that the original purpose of the arts was to decorate and beautify the built environment. Bauhaus sought to place art back into this context by joining the arts and the crafts so that they work together. This idea was not totally original, and various academics had been discussing and publishing this sort of philosophy since about 1916, but through the Bauhaus, Gropius had the opportunity to implement this philosophy in practice. The school encouraged creativity, individuality and freedom with a strict study discipline. The practical emphasis was maintained by attaching a workshop to the school, which completed outside commissions and maintained close links with external workshops. The plan was that eventually the workshop would fund the school. Students were trained in crafts (stonemasonry, cabinet making, ceramics, etc. ); Drawing and painting; and science and theory (materials science, anatomy, book-keeping, contract negotiations, etc). This program was offered at the three levels of apprentice, journeyman and junior master. Within this overall framework the masters were free to use discretion about what was taught. A condition, however, was that students were not allowed to specialize to the exclusion of other disciplines. For instance a student studying painting also needed to spend some time participating in the other courses. On the title page of the manifesto was a woodcut of a cathedral under 3 stars. This image encapsulated the Bauhaus philosophy. The Gothic cathedral represented man's longing for a spiritual beauty that went beyond the purely functional. The cathedral demonstrated the result of combining art and craft in the built environment. The three stars are reminiscent of the three branches to the curriculum described in the manifesto. From the early days of the school, the Bauhaus was able to attract a highly creative faculty of masters, resulting in a prolific output of modernist design and architecture which had a lasting impact. In accordance with the manifesto, the Bauhaus school consisted of a preliminary course for new students, designed to provide an overview of design and weed out the unsuitable students, after which the school was divided into workshops. Each workshop was overseen by two masters. A Master of Form to provide artistic/design guidance, and a Master of Craft specializing in the techniques of that workshop. In this way the Bauhaus achieved the combining of art and craft. The individual workshops included pottery, textiles, furniture, stained glass and mural painting, book binding, graphic printing and theater. Since our main interest is graphic design it is worth spending time investigating the graphic printing workshop as an example. The graphic printing workshop was run by Master of Form Lyonel Feininger and Master of craft Carl Zaubitzer in the Weimar period. The dominant techniques they used were woodcutting and copperplate engraving. 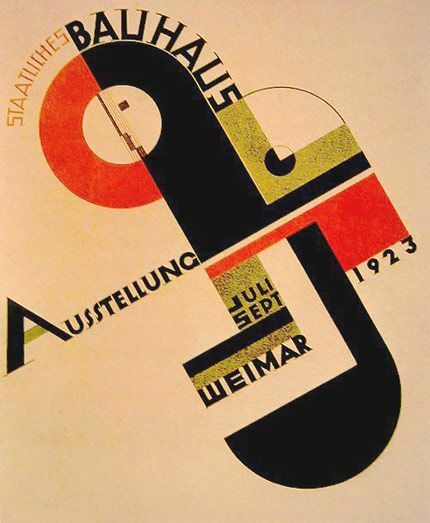 In 1922 the graphic printing workshop stopped accepting apprentices and instead trained all Bauhaus members in the techniques on request. This shift was to turn the printing workshop into a production workshop accepting outside commissions. Gropius made this change to provide funds to support the school. The workshop produced a series of portfolios on modern European prints in the years 1922-24. These were among the best produced in the genre at that time. At about this time the Bauhaus also established a publishing house to increase the financial independence of the school and spread the Bauhaus message. Walter Gropius (1883-1969) was born in Berlin and studied architecture in Munich and Berlin from 1903 till 1907. He began work as an architect in 1908 and opened his own practice in Berlin in 1910, where he built an international reputation as an innovative designer of modernist factory buildings, using glass and steel in new ways. An example is the Fagus Werk factory in Alfeld (pictured), which he designed with colleague, Adolf Meyer. Gropius was the director of the Bauhaus School from its beginning in 1919 to April 1928. Apart from establishing the school and providing the guiding vision, he also designed the new school buildings in 1925/26 when the Bauhaus moved to Dessau. In addition to director he was Master of Form in the joinery workshop from March 1921 to April 1925. After leaving the Bauhaus he continued as a practicing architect. He also gained a post with the Graduate School of Design in Harvard/USA, becoming the head of the architecture department in 1938. He remained the inspiration and guiding authority for the Bauhaus until it closed. Throughout his life he remained committed to the Bauhaus philosophy and continued to promote Bauhaus ideals throughout his life. Johannes Itten (1888-1967) was a painter and art theoretician and a master at the Bauhaus from October 1919 to March 1923. He began his career as a school teacher before continuing his education, training in mathematics and art. He was attracted to eastern philosophy, and promoted these beliefs at the Bauhaus. After leaving the Bauhaus he went on to a number of successful academic posts in various prestigious art schools. Itten was a highly charismatic and dominant figure in the early Bauhaus. He introduced a 'Vorkurs' ( or preliminary course) for the students, which evolved through the history of the Bauhaus, but remained fundamental to the Bauhaus teaching program. Best described as an expressionist artist, Itten took the Bauhaus in a distinctly expressionist direction. His students worked through a series of investigations in contrast, form, colour, rhythm and texture etc. In other words his students explored what we know in our course as the design elements. He developed an appreciation of these elements of design through the study of natural objects and materials, the analysis of Old Masters, and life drawing. The educational approach used by Itten survives today, in modified form, in many design courses. A testament to his vision and ability as an educator. Theo van Doesberg (1883-1931) was born as Christian Emil Marie Küpper in Utrecht, but as an adult adopted his step father's name of Doesberg, adding the Van himself. De Stijl graphics and design by Van Doesberg (above) and Gerit Rietveld (right). De Stijl designs are characterized by simple geometric lines and forms, and primary colour. Laszlo Moholy-Nagy (1895-1946) was a Hungarian born artist who was a master at the Bauhaus from April 1923 to May 1928. He was master of form of the metals workshop and was for a time the head of the preliminary curriculum which Itten had established. He also edited the the Bauhausbucher. After leaving the Bauhaus he continued his career as a designer in various places around the world and published work on design theory. He founded the 'New Bauhaus' in Chicago in 1937. Apart from his contribution to design theory Moholy-Nagy's work at the Bauhaus were in the areas of typography and experimental photography. Paul Klee (1879 - 1940) was a Swiss born painter. He was a master at the Bauhaus from January 1921 to March 1931. Apart from teaching some painting classes he was at various times head of the stained glass workshop and taught various courses including design theory for the workshop. 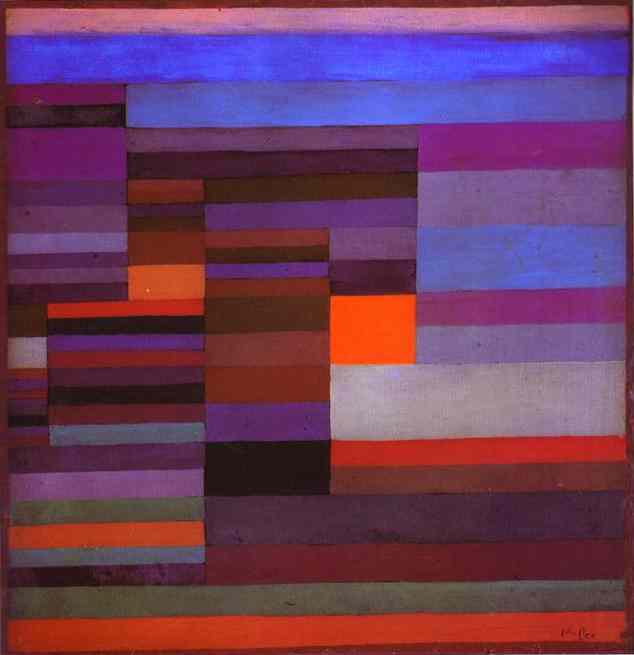 Klee was a highly respected artist and a contributing personality to the Bauhaus. His design teaching had a significant impact on the bauhaus style, especially the weaving work. He integrated modern visual art with images from non-western art and the artwork of children to produce highly expressionistic images. Wassily Kandinsky was born in Moscow in 1866 and died near Paris in 1944. Prior to being a master at the Bauhaus, Kandinsky had already established himself as a painter with numerous exhibitions and academic posts in Europe. He was a master at the Bauhaus from June 1922 to April 1933. During this time he was head of the mural-painting workshop as well as teaching various other courses. Kandinsky's work prior to Bauhaus was abstract in nature. While at the bauhaus he explored colour theory and design especially in relation to forms. His work explored geometric forms, in particular straight lines, curves and circles. He generally used strong colour. The forms of Bauhaus design are usually simple and light without much decoration added. All the objects are highly functional, as with most modernist work, but there is also a striking originality about the way the design brief has been solved. A chair, for instance, will be designed to be used in comfort and be simple to look at, but there will be surprising elements which make it look quite different to the traditional design. Below is a series of images presented by the Barbican Museum in London illustrating Bauhaus design and life at the school.